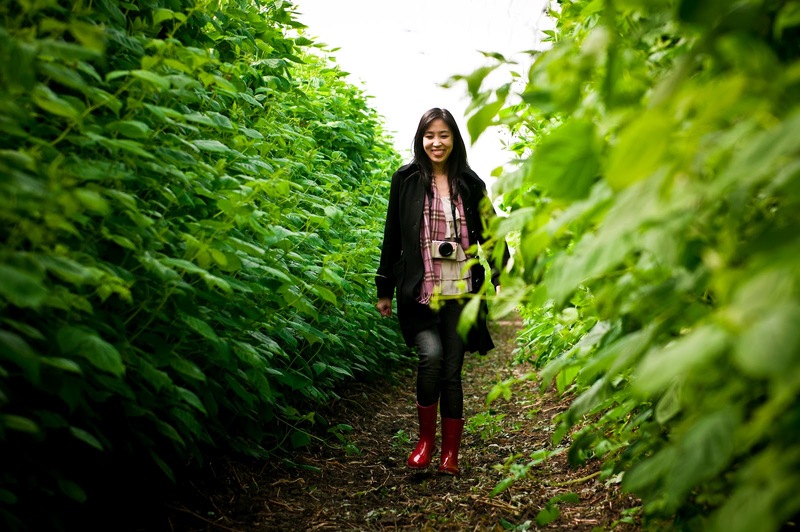 Anita taking a romp through the muddy raspberry tunnels. 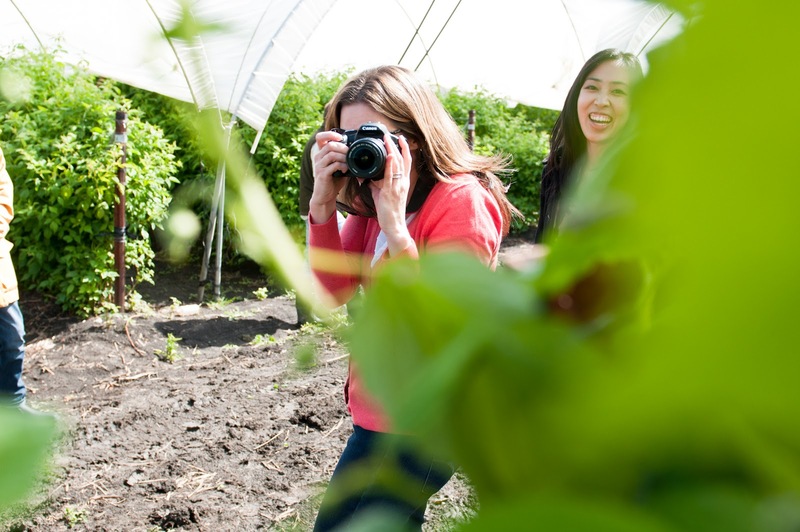 Last weekend, the wonderful folks at Driscoll's Berries hosted a ROAD TRIP! for a bunch of us blogger types to visit one of their berry farms near Monterey and then to attend the Pebble Beach Food & Wine Festival. I'm usually a bit wary about these things, but I just can't say "no" to a berry farm--it's been too many months since the last time I was in one. And, it actually turned out to be a super fun day, talking to one of the scientists who heads up strawberry breeding (yay, science! I asked statistics questions--cause I'm a geek like that), hearing from one of the Driscoll's growers, and spending the day with some of my favorite Bay Area people: Anita, Shauna, Sabrina, and Irvin. As a huge, huge bonus, Kamran flew in from New York for the event and was an honorary Bay Area blogger for the weekend, making me wish for the millionth time that New York and San Francisco weren't so many miles apart. I discovered this weekend also that when Kamran visits, he comes bearing awesome gifts, like a copy of the brand new, hot off the presses Ripe by Nigel Slater. The morning after I received the book (thanks, Kamran! ), I cracked it open and within seconds wanted to do nothing but devour the entire book from cover to cover (which is a wee tad impossible in one sitting, given how monstrous it is!). 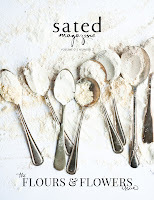 It is such an utterly beautiful book in every way--the photographs, the typography, the recipes, and the writing. The recipes are incredibly simple and appealed immediately to my Berkeley/Chez Panisse-grown sensibilities of doing as little to good ingredients as possible. And they aren't dry recipes to read, either: studded inside the instructions are small colloquial comments from Slater--like how mixing the dough by hand instead of via a food processor is a rewarding and relaxing experience if you have the time. It's personable and human in a way that gives you a warm fuzzy feeling as you read while most recipe writing these days focuses solely on the mechanical and reads like technical manuals (my own included!). 1. for rhubarb. Preheat oven to 350° F. Preheat a baking tray in the oven for the cake. 2. Chop the rhubarb stalks into roughly 1-inch pieces. Place in a baking pan. Sprinkle the brown sugar, water, and orange zest on top of the rhubarb. Bake for 20 – 30 minutes, until the rhubarb is fork-tender but not too soft. Do not overbake; the rhubarb should still hold shape. Remove from oven and drain the rhubarb. 3. for cake. Grease and flour the bottom and sides of a 6-inch round cake pan. Set aside. 4. In the bowl of a food processor, combine the polenta, flour, baking powder, cinnamon, and brown sugar. 5. Cut the butter into the food processor bowl. Pulse until the mixture resembles breadcrumbs. 6. In a separate bowl, whisk together the egg and milk. Add to the food processor. Pulse just until a soft and slightly sticky dough forms—do not overmix. 7. Press about two-thirds of the batter into the bottom and up a bit of the sides of the prepared cake pan. Make sure there are no gaps or cracks. 8. Top batter with the drained rhubarb stalks, leaving a small border around the edge of the pan. 9. Place chunks of the remaining batter on top of the rhubarb. The rhubarb does not need to be completely covered. 10. Sprinkle with turbinado sugar. 11. Place the cake pan on the preheated baking tray and bake for 40 – 45 minutes, until the edges are golden brown. Remove from the oven and place on a wire rack to cool. Wait to unmold the cake only when the cake pan is slightly warm to the touch. 12. for raspberries. Meanwhile, spread the coconut chips onto a baking tray. Bake for 3 – 5 minutes, watching closely so the chips do not burn. When they turn golden, remove from the oven and let cool. 13. 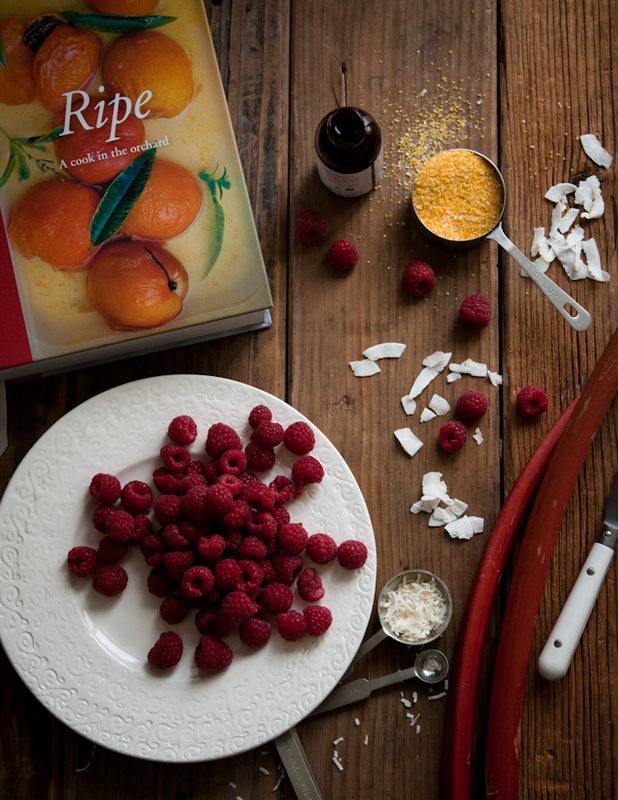 In a bowl, gently stir together the raspberries, sugar, coconut extract, and water. Let sit for 15 – 30 minutes, until the raspberries are glossy and the sugar has dissolved. 14. Mix the dried coconut chips into the raspberries just before serving with the cake. Shauna and Anita caught me lurking behind a raspberry plant trying to take photos. I find I keep moving farther and farther away from my food processor and mixer - while I love fast results, there is something so rewarding about using my hands, doing the work myself. I can't wait to get this book! This looks absolutely delicious and beautiful. 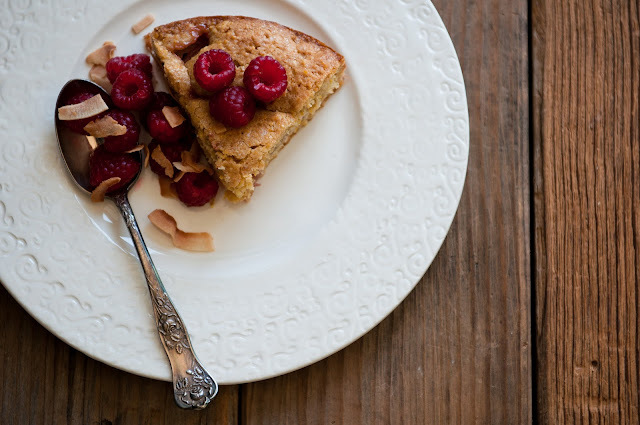 OOh I adore polenta and raspberries in a cake. Make something similar last year too. S. gorgeous pics! 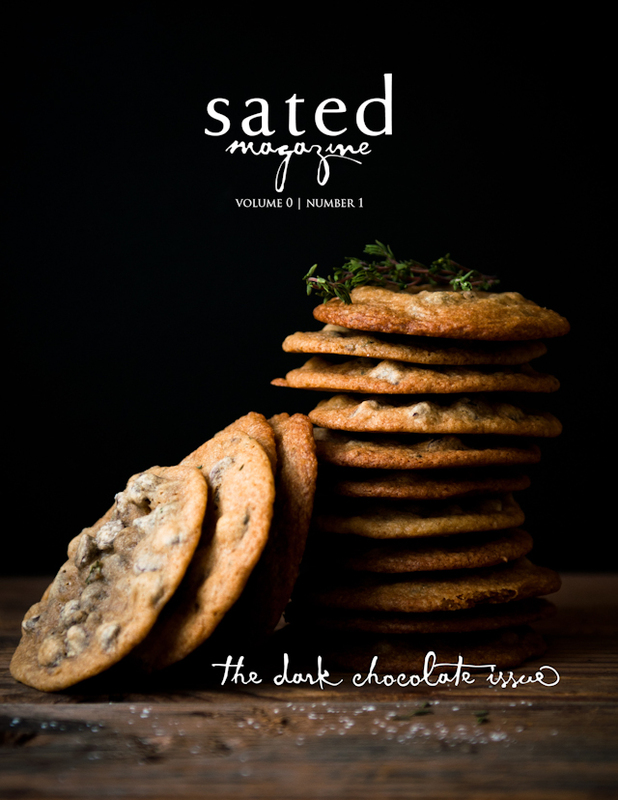 Amazing recipe and the photos are beautiful as always. Raspberry season is soon here in Hungary so I'll definitely try this recipe! This cake is filled with awesome flavours! Love it! When I saw this recipe I thought something was rather familiar. In fact I realised that I made it the other week from Nigel Slater's book (which in England is called Tender Volume II) and I can testify that it is indeed delicious! 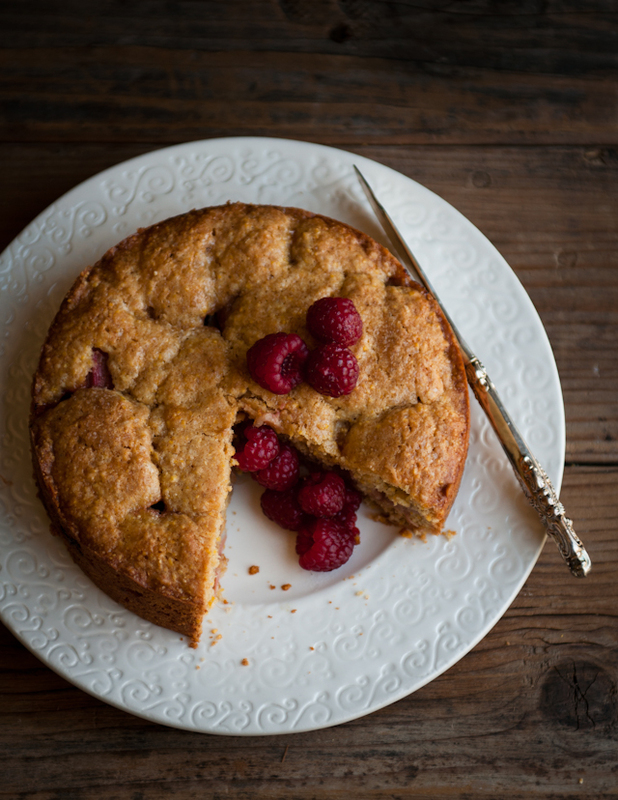 rhubarb polenta cake! what! As you know Ive been staring down this book. Some of my all time favorite imagery. I made a carrot cake from his other book and I royally failed. How did you find the recipe? Was it spot on? Lovely post! 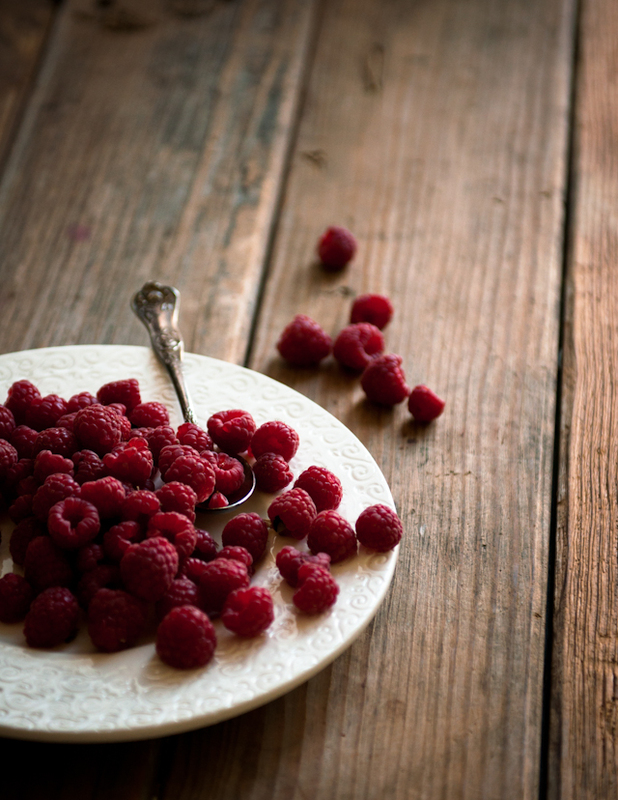 I love raspberries. They are so much more expensive where I am in Asia. Btw, I also love Anita's red boots in the first picture! Awesome post and I am going to order that book today! Love it!!! Sugared coconut raspberries? Oh man. This looks so delicious. Ripe looks good - I think Slater is improving with age. Love the photographs and the cake! 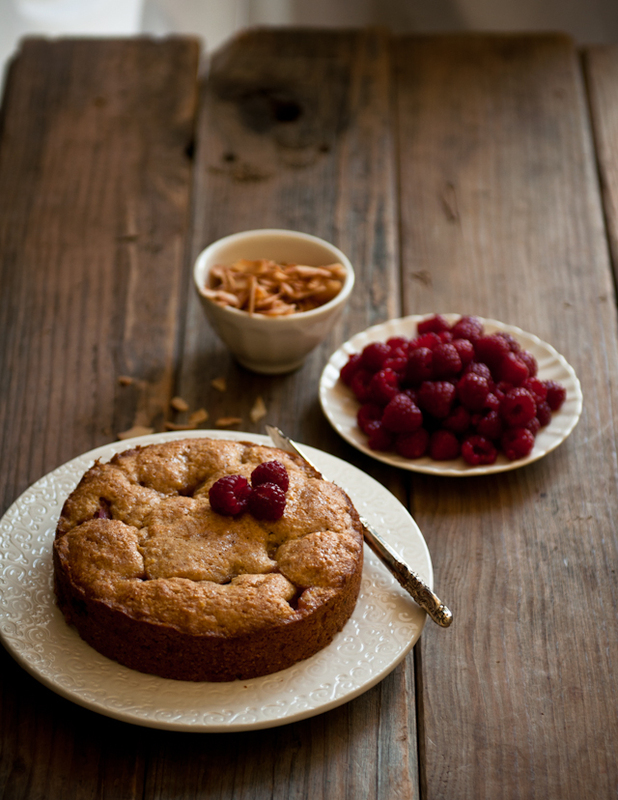 I have a new love of polenta cake after making a lemon and berries one. Amazing light in your images so beautiful . 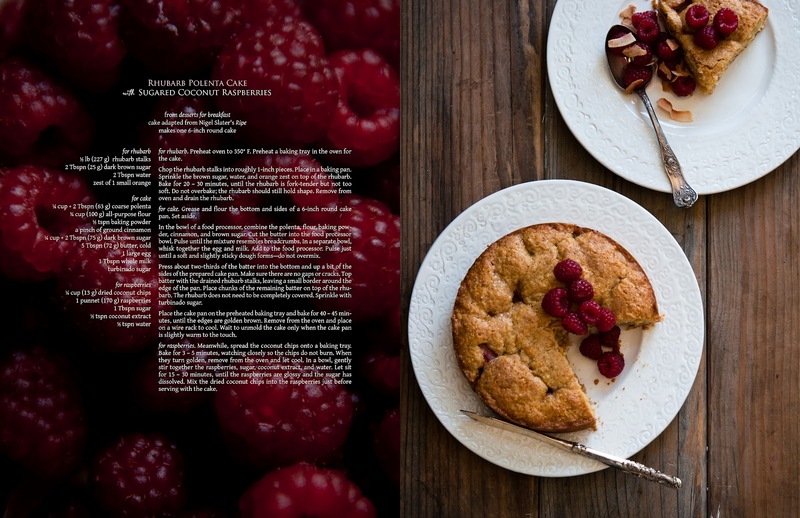 My heart skipped a beat reading just the two words, raspberries and polenta! SO when do I get to taste it or should I better make it myself? :-) I am glad you guys had a great trip. sounds utterly delicious & looks gorgeous! how gorgeous! i can't believe this is my first time visiting your site - it has my name written all over it!